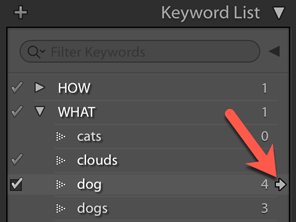 Lightroom Classic Tutorials > Organizing Photos > Keywords > How do I clean up my keyword list? 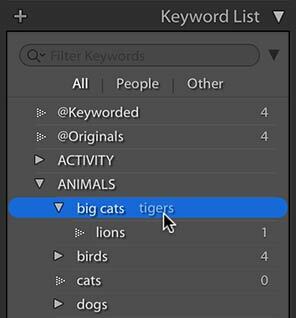 In the previous post, we learned how to start keywording from scratch, but many Lightroom users have already added a few keywords, so this week, we’ll do some cleanup. How do I edit an existing keyword? 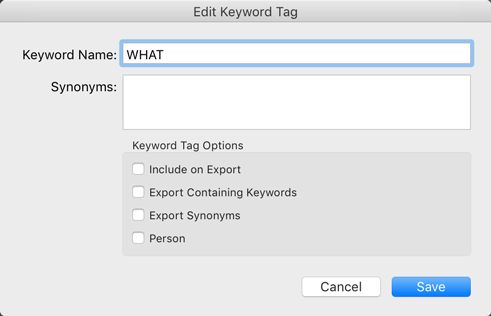 If you want to edit a keyword, perhaps to correct the spelling, simply right-click on the keyword in the Keyword List panel and select Edit Keyword Tag. When you rename a keyword, it’s automatically updated on all of the tagged photos too. How do I delete a keyword from a single photo or from all photos? 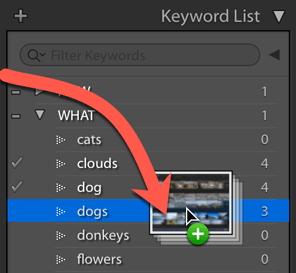 If you add a keyword to a photo by mistake, you can remove it using either the Keywording or Keyword List panel. With the photo(s) selected, select the keyword in the Keywording panel and press Delete/Backspace to delete the keyword, or remove the checkmark against the keyword in the Keyword List panel. To delete the keyword from the keyword list as well as any tagged photos, select it and press the – button at the top of the Keyword List panel, or right-click and select Delete. How do I create or change the keyword hierarchy? By default, new keywords are added as a flat list, but you can drag and drop them into a hierarchy of nested keywords. As you drag a keyword onto another keyword, that new parent keyword is highlighted. When you release the mouse, the keyword moves inside the new parent keyword, just as you would drag folders onto other folders to make them into subfolders. If you want to do the opposite and change a child keyword into a top-level keyword, drag and drop the keyword between existing top-level level keywords instead. As you drag, a thin blue line appears. Don’t worry about dropping it in the right place in the list, as the Keyword List is automatically set to alpha-numeric sort. If you’re building your keyword hierarchy for the first time, and want to add a series of child keywords inside the same parent, select Put New Keywords Inside this Keyword from the right-click menu. Any new keywords are then added to that keyword as child keywords, unless you specifically choose otherwise. The keyword is marked with a small dot next to the keyword name to remind you. To go back to adding new keywords at root level, right-click and uncheck the same command. How do I merge duplicate keywords? In the Keyword List, click the arrow to the right of the “wrong” keyword to show the photos tagged with that keyword. Select all of the resulting photos in the Grid view and drag them onto the “right” keyword, or check the checkbox next to the “right” keyword. 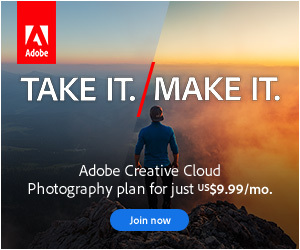 This assigns the “right” keyword to the photos. Finally, go back and delete the “wrong” keyword. Over the last 4 weeks, we’ve only skimmed the surface of keywording in Lightroom. We’ve discussed the kind of keywords you might add, whether to use flat or hierarchical keywords, and the basics of getting started with adding keywords to your photos. For more detailed information, see the Keywording section of my LRCC/6 book, starting on page 140. Next week, we’re carrying on with the cleanup – this time, merging and deleting multiple catalogs. 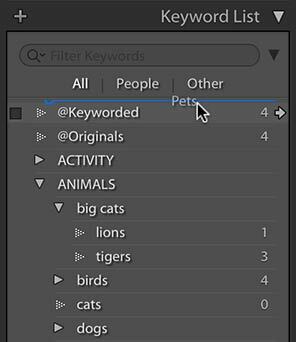 I set up a really nice keyword hierarchy in light room based on your instructions. I did want to mention that one thing I found out after I had set it up and exported a bunch of photos to apple photos, is that the keyword hierarchy does not export correctly. All of my exported photos have only the top level keyword (for example “who “) which really is no use. Because my Workflow involves exporting all of my photos to apple photos, and I don’t want to lose my keywording there, I can’t find a way to make the keyboard hierarchy work well for me. Do you know of any workarounds? 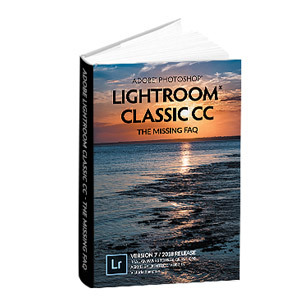 When Lightroom exports the photos, it includes both the keyword hierarchy (which only a few programs can understand) and also the standard flat keywords that other software should understand with no issue. If you go to the Keywording panel and set the pop-up to “Will Export”, does it show the individual keywords? If so, it sounds like Photos is mangling them. To clarify: I had my keyword hierarchy setup with WHO and WHAT at the top level. I checked the option to export keywords. When I exported and then imported to Photos, only the WHO and WHAT are coming through, not the words underneath that (like ‘Daddy’ and ‘boating’). Will update later if I get to test it out again. I was disappointed not to be able to use the hierarchy. It felt really clean and well organized. Sometimes when I add a new Keyword to a Hierarch, I see it in the KEYWORDING BOX showing the complete Heirarchy for Example USA>NY>NYC>MANHATTAN>EMPIRE STATE BUILDING. If I only want “EMPIRE STATE BUILDING” to appear, how does one accomplis that, I assume it has omething to do with the EXPORT CONTAINING KEYWORDS check box, evn though I may not be Exporting? That sounds like Empire State Building is in the keyword list twice, so it’s having to specify which one you mean. Try using the Search field at the top of the Keyword List panel to decide which of the keywords you want to keep. Drag and drop not that easy to use in my experience. You can move a few existing keywords to nest with your chosen higher level one then it goes pear shaped with all the keywords above the one selected being highlighted. I’ve got a lot of work to do to get my keywords into a more use able form which the hierarchy approach gives. One thing I have found very useful is you can cut and paste keywords into Lightroom from Word – very useful if you need to use Norse, Greek, German or other languages with more letters/sybols than the standard keyboard. I’ve found your question on the help forum, but I can’t find your bug report on the Official Feature Request/Bug Report Forum at https://feedback.photoshop.com/photoshop_family/topics/new/add_details?topic%5B where it’ll actually get in front of the engineers. It does sound very frustrating, but it’s not something I can tell you how to fix, unfortunately, because it doesn’t sound like you’re doing anything wrong. If you can record a video of it happening, and add that to the bug report, that should get it a bit more attention from the engineers. Didn’t know about how to get this in front of LR’s engineers until you posted the link. I’ll be doing something about it shortly with some screen shots (if I can work out how to do it). Bug report now done. Nice if it could be sorted – and have asked if a better way of doing through the edit dialogue box could be included (and for perpetual license users like me) as a wider improvement. This method works fine if you have a few dozen keywords, but how do we tidy up a few thousand keywords? I have a mostly hierarchy based list, but with a few hundred keywords added as a flat list when I’ve been rushing jobs. Meaning I have a rather cumbersome list now. It’ll still be a drag-drop job I’m afraid Reuben. One thing that can help is dropping all of the flat ones into a “sort me” keyword or some other temporary grouping, so you can keep the other keywords collapsed while you work. It makes the list a bit shorter, so easier to scroll. That’s what I feared! But that’s a brilliant idea regarding a “Sort Me” keyword, which I’ve now added! Thanks! If you right-click on your Sort Me keyword and choose Put New Keywords Inside This Keyword, any new flat ones will automatically get dropped in there in future. I’ve done that and also unticked the “Export This Keyword” checkbox, so I can happily add child keywords to this parent, but not have the parent export to lots of random photos. Congratulations Tim, thanks for sharing!